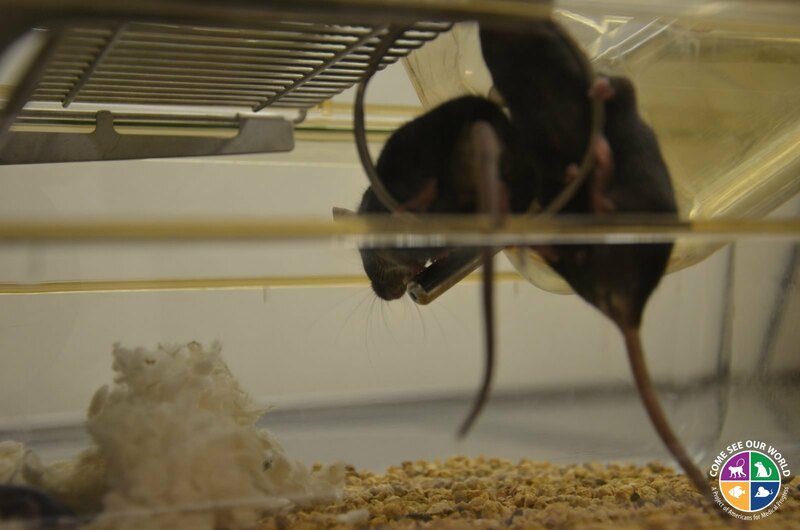 These mice are part of a study to help understand how HDL cholesterol, “the good cholesterol,"protects people from heart attacks. They are transgenic mice carrying the human gene APOA1, which produces a protein component of HDL cholesterol. Animals with this gene are highly resistant to heart disease. When they reach one year of age, which is the physical equivalent to a 58 year old man, the mice will undergo stress tests which involve running on a mini-treadmill to evaluate their heart health. Sensitive monitoring equipment will record the data. The data will then be compared to mice that undergo the same experience, but do not carry the APOA1 gene. Researchers hope that by comparing the data, light will be shed on the role of APOA1 and how deadly heart attacks might be prevented.